i've seen more than a few flamey mercurys (mercuries?) lately. why is that? i suppose because they're awesome that way. it was hot and extremely windy when i took this shot a few weeks ago in riverside. 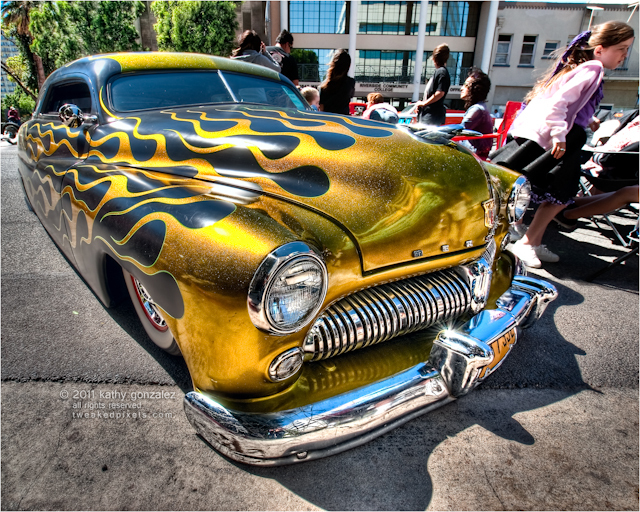 it was the glitter painted flames that stopped me first, and that it had a hood ornament – bonus. almost gave up trying to get a shot of it, there were too many people around. i am at the point where, i figure, screw the people milling about if they're not in focus, just get the car. otherwise, the best cars just can't be captured. i hate the ones that i let get away in the past because people wouldn't move. fortunately, the majority of the time, if you whip out a tripod, people will move, same way i try to stay out of someone else's shots. i have some patience, and i can wait. anyway, i think i'll hit you all up with a short series of mercs. why the hell not. i keep seeing them, so why shouldn't you?